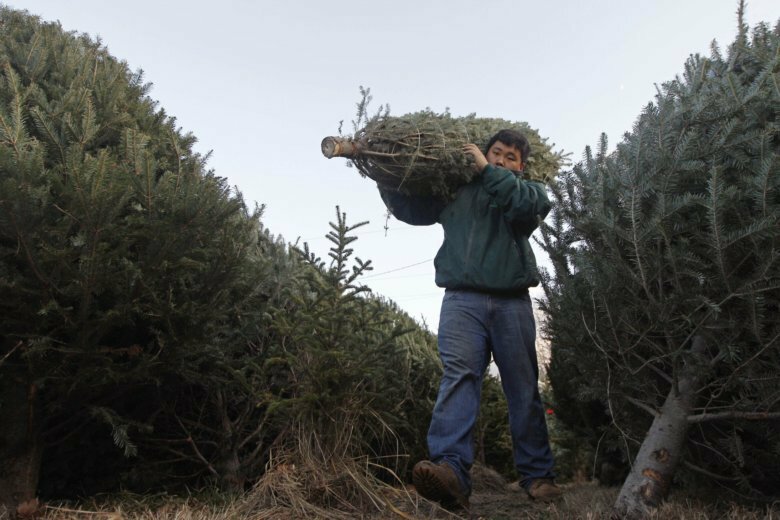 With the most wonderful time of the year on the way, WTOP Garden Editor Mike McGrath has some care tips for your Christmas tree and other tree-related advice. Don’t forget to hydrate your cut Christmas tree! Whether you get your cut tree from a local Christmas tree farm or a shady character outside of a bar in Old Town, make sure the needles and branches are supple and flexible. If they feel the least bit stiff and brittle, take a pass. Have the tree shaken vigorously side to side to get rid of bugs and debris before you take it home. When you get it home, use a bow saw to cut another inch or two off the bottom. Then, attach the stand and bring the tree inside to the coolest possible area — away from any hot air vents or radiators. Refill the stand with lukewarm water and wait a full 24 hours for the tree to spread before ornamenting it. From then on, do not let your water-holder run dry or the tree may not be able to take up water afterward. That white paint you remember was to prevent sunscald by reflecting rather than absorbing the wicked Arizona sun, Bev. It has no effect on “suckers,” opportunistic shoots that pop up around the tree, which sycamores are notorious for. The most common remedy is to mow them down while they’re young or prune them out when they’re bigger — but, either method of cutting induces the tree to release a hormone that favors more suckers. Snapping them off is the preferred method. Where, oh where is my Christmas tree farm? Yes, with apologies, Jim. I recorded those bits super-early in the week because of Thanksgiving and didn’t have time to check last year’s lists. When I did, I discovered that none of them worked anymore. Sigh. The best way to start is to go to PickYourOwnChristmasTree.org and then insert your state. There are plenty of good listing for Northern Virginia and nearby Maryland. Virginia.org also has a nice little list. Verticillium is a wilting disease that lurks in all of our soils. It is 100 percent responsible for the death of tomatoes that have been planted in the same location for three years or more. It can also be a contributing factor in the death of other susceptible plants — including your Japanese maples — but, it is never the initial problem. Japanese maples require exquisite drainage, and when they don’t get it, they often succumb to disease. Improve the drainage and plant new trees in an adjacent area — not directly where the deceased trees used to be. Time for me to both praise my favorite holiday plant and warn about its most important weakness. My praise and caution go to those beautiful and fragrant rosemary Christmas trees now on sale at local independent garden centers and upscale supermarkets such as Whole Paycheck. If you’re a cook, these foot-and-a-half to 2-feet tall live shrubs contain a huge amount of super-fresh rosemary, about 10 times what you’d pay for the cut (and often dried-out) herb in any other form. If you just want a cute little tabletop tree, they’re perfect. Or, double up: Decorate it for the holidays and then prune it for fresh herb cooking afterward. But, however you use it, you must repot it into a container at least twice as large as soon as you get it home. These little trees were pruned down from huge shrubs and are always so rootbound that they can’t take up water. Give them a bigger pot, and rosy your little tree will be.